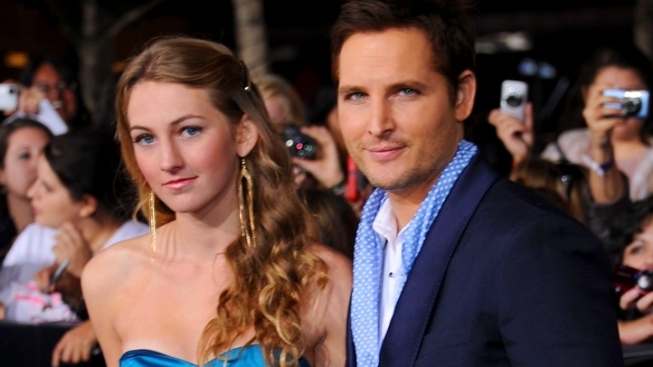 With four movies under his belt as vampire/doctor Carlisle Cullen, Peter Facinelli’s gotten to know a little about blood, both on the operating table and as a dinner entrée. With "Twilight: Breaking Dawn Pt. 1" having a monster of an opening weekend, the actor lets us in on the the phenomenon, including what it was like to attend the Bella-Edward wedding and the most shocking thing he heard from a fan. I think there's a family feeling between all of us. It's like going on a road trip with somebody, and it's this has been a long road trip because we've gone through five films in three years. We've all gotten to know each other really well. We've been there from the beginning with each other, so it's really becoming this little niche family. Then you welcome new family members in. After 'Twilight' we welcomed in the werewolves. That became a new piece. With 'Breaking Dawn,' in part two, we have a whole other group of vampires coming in. But the core of the Cullens is always there. It's kind of nice in the sense that we might not see each other or talk to each other for a couple of months because everyone is off doing different projects and are busy, but when you see them it's like you saw them yesterday. I think that's a true test of a good friend or someone who's a family member. It's not awkward. You see each other and it's like you saw them the day before. The set was really beautiful and the tables were all lit with wonderful candles. The bummer is that it rained, like, every day. So as much as it was kind of visually beautiful, there were tarps up and it was pouring rain at time. There was mud all over the floor. At times the tarp would break and water would come rushing down on somebody and it was cold and wet. You just kind of had to keep going through it and know that with movie magic no one was ever going to see that – that it was just going to look beautiful. Then there were moments of just pure beauty, where Bella was coming down the aisle. It's just a magical moment and really beautiful. You get sucked in by that and forget all about the rain. There's always somewhat of a pressure because a lot of people are going to see it, but when you're filming you don't walk out on the set, thinking, 'Oh, gosh, all these people…’ because that'll drive you insane. You go there as a professional actor and you do the best job that you can and you just throw it to the audience and hope that they like it. So we knew by the fourth film that this was a lot of movie that people were going to see, but I think in some ways there's more pressure on the director. For us, we've played these characters before and it's just a matter of coming and making sure you're doing you’re A-game and then giving it over to the director. That director, there are three successful films all ready and so now they have this film on their plate and he doesn't want to be the one to drop the ball. I felt like Bill [Condon] had a lot of weight on his shoulders, but he handled it well. We've done five films, and so it's nice to be able to put this chapter behind and go on and do new things. Time-wise I've been so wrapped up in doing these films that I haven't been able to do a lot of other stuff other than 'Nurse Jackie.' It's a double-edged sword: you're sad that it's ending, and at the same time you're glad to be able to move on. We're doing Season Four of 'Nurse Jackie' right now. I have a production company and we have four films in development. Some of them I'm writing. Some of them I'll have other writers do. I've shot two movies already that I wrote: One of them is called 'Loosies.' That comes out in theaters in January and we're doing a pre-theatrical release on VOD November 9th. Check it out. It costars Jamie Alexander from 'Thor.' She plays my love interest, and then Vincent Gallo, Michael Madsen, Joey Pantoliano. It's a really fun cast. I play pickpocket in New York who lives this carefree and loose lifestyle and then he ends up finding out that he got this girl pregnant on a one night stand and his whole world comes to a screeching halt. The core of it is a love story with comedic elements.